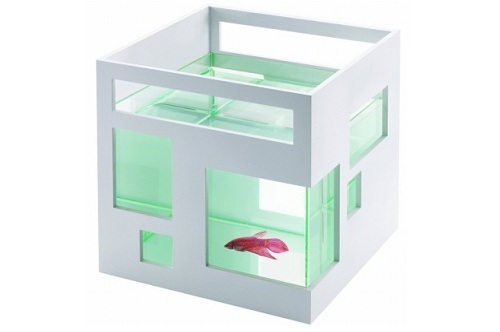 The Umbra FishHotel is an award-winning modern home for your finned friends. Modeled after a contemporary condominium, this reinvented aquarium features a sleek white shell with assymetrical "windows." Individual units can be stacked to create a condo effect. Built to give your small fish a modern, stylish home, the Umbra FishHotel is a beautiful aquarium that lets you stack others on top of it to maximize space. Price: $34.99 & FREE Shipping.